LEFT:Captain J.R. Neave MC, of the Malayan Civil Service. He was on the General List, serving with 1st Battalion, Federated Malays States Volunteer Force. He died of wounds received in action. He was awarded the Military Cross in 1917 while serving with the Lincolnshire Regiment. RIGHT: Private William Leigh, Malay States Volunteer Rifles. 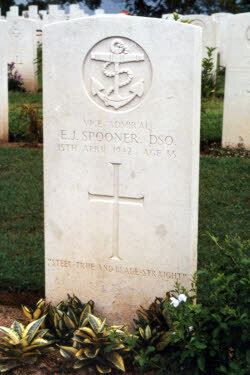 He was killed in the Mutiny of Indian Troops in Singapore 1915. A Volunteer soldier, William Leigh was employed by the Singapore and Penang Rubber Plantation. LEFT: Sgt A.G. Craig of 488 Sqn RNZAF. He was a Buffalo pilot based at Kallang Airfield and was killed in a crash. LEFT: Vice-Admiral E.J. Spooner DSO. Vice Admiral Spooner along with Air Vice-Marshal C.W.H. Pulford were among the last to attempt an escape from Singapore on 13th February 1942. They were in a group of 50 in a motor launch. This was attacked by Japanese aircraft an run aground on the island of Chibia. Both Spooner and Pulford died of Malaria during the two months the survivors were on the island before being taken prisoner by the Japanese. LEFT: Royal Navy graves in the East of the cemetery : RIGHT: British and unknown British graves.